Tadeusz Kosciuszko (1746–1817) was a Polish, Belarusian and Lithuanian national hero, and an honorary citizen of France who fought in the American Revolution under George Washington. In recognition of his dedicated and faithful service he was brevetted by the Continental Congress to the rank of Brigadier General in 1783, and became a naturalized citizen of the United States that same year. 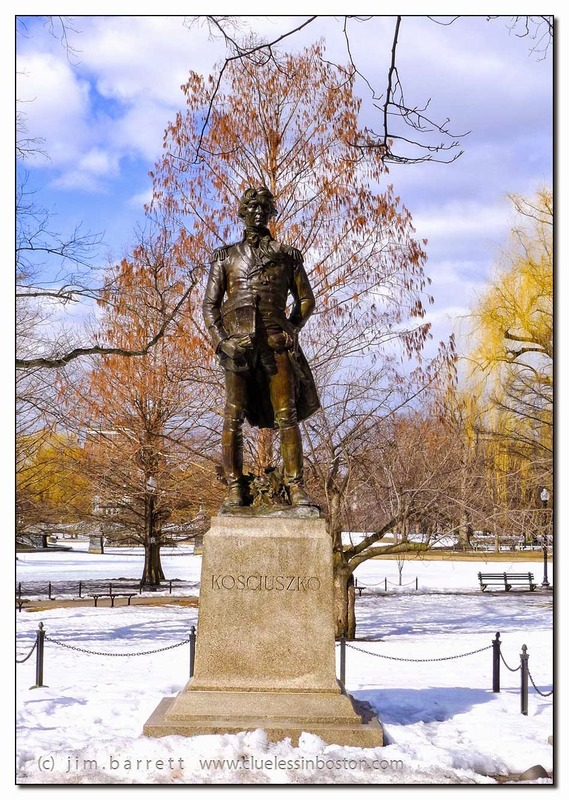 This statue, erected in 1927 to commemorate the 150th anniversary of the enlistment of Kosciuszko into the Continental Army, is the work of Theo Ruggles Kitson (1876-1932), one of the most prolific female bronze sculptors in America who also designed the world renowned statue of the Minuteman at the Lexington Battle Green. The sculpture portrays Kosciuszko holding the plans for the future West Point. The statue is located near the Boylston Street entrance of the Public Gardens. Very dashing looking fellow and a beautiful bronze statue and a lovely sky. We have now a politic woman in France who have the same name! I see that you still have snow, must be beautiufl under blue sky! Your framing makes him look like a fiery angel. Like it.